From Work, No. 161, 1892. Find more reprints of Work at Tools for Working Wood. The wheel barrow is an old device replacing the hand barrow which was more of a stretcher-like contraption. Simple as it is, it is one of those benchmark inventions and should not be overlooked in the realm of important technological innovations. An excellent post from Michael Langford (michaellangforddotorg). I have come across this somewhere before, I think through Tom Hodgkinson’s Idler essays. Anyway, another important, but nearly lost, part of our history and how we surrender so willingly to authority. Practically, their work discusses the effects of enclosure, the systematic disruption of English village life by taking of common land by the aristocracy. Enabled in large part by the Glorious Revolution of 1688, enclosure became an instrument of massive land theft by the titled classes, legitimized by Parliament. Through the penal laws and the practice of transportation, plantations in the American colonies were provided with cheap labor. 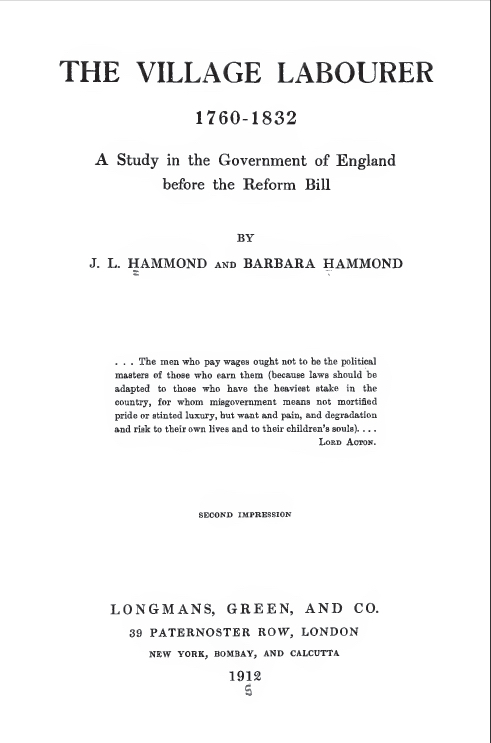 The Concentration of Power , the controversial first chapter of The Village Labourer , was only printed in the first edition of the book.